On top of all the other damage that some perceive that the Law-and-Justice party are currently doing to the country, the recently-elected right-wing nationalist Polish government has controversially approved logging bits of Europe's last primeval forest. Białowieża was designated a UNESCO World Heritage site in 1979. The new plans (announced precisely at the beginning of the Easter holiday in the hope the news will not attract attention) now concern felling three times the area of this important ecosystem than was being protested against here a few weeks ago. No details, such as detailed maps showing where this logging will take place have been produced for public discussion yet - the administrative decision seems to have taken place without one. This is appalling and this must be stopped. 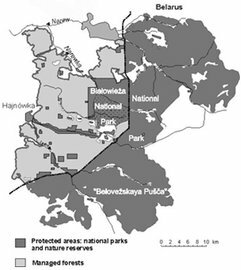 Sprawling across 150,000 hectares, the Bialowieza forest reaches across the Polish border with Belarus, where it is entirely protected as a nature park. It is home to 20,000 animal species, including 250 types of bird and 62 species of mammals—among them Europe's largest, the bison. Europe's tallest trees, firs towering 50 metres high (164 feet), and oaks and ashes of 40 metres, also flourish here, in an ecosystem unspoiled for more than 10 millennia. The arguments presented to the Polish public by the present government's Ministry of the Environment is that if trees are left standing (growing) in the forest, then they die, fall and the valuable wood rots. So if they cut them down while they are growing, then they "save" the wood. This is exactly the same argument that artefact hunters use, they are "saving" the dug up artefacts they get from their robber exploitation of the (historical) environment from "damage" or "loss". In both cases it is equally specious. The artefacts form part of archaeological assemblages, the trees part of an ecosystem - and in both cases the status quo of centuries and millennia is being disrupted. Vignette: Map of forest complexes stretching across state border most of it is out of the reach of Polish loggers.